Serving Others = Serving God! Gary Chapman, the author of “The Five Love Languages” just recently published an article entitled, “The Five Signs of a Healthy Family.” In this short article he identifies some significant attitudes that make up a healthy family. First he says, “In a healthy family there will be an attitude of service.” If you Study Ephesians 5 and 6 regarding instructions to wives, to husbands at to children, the key issue is acceptance of one’s role in the family unit, embracing it and living it out in our daily lives. Wives are challenged to submit. Husbands are charged to love sacrificially, and children are commanded to obey. Fathers are given an additional admonition regarding the children to “…bring them up in the discipline and nurture of the lord.” When these attitudes are embraced within the family out of reverence for God, and His Word, service for one another becomes a way of life and make for a healthy, happy home. He suggests a couple games we can play in the home to foster these attitudes. Game one is reciting a statement in the home designed to help promote these attitudes. Whenever possible say “I really appreciate that…” When a member says that to you, your response should be, “and I really appreciate that…” He says, “The purpose of this game is to have a heart of appreciation and gratitude. This shows both love and respect for those that we serve. Our family is most paramount. 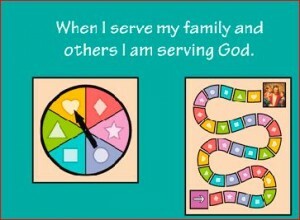 That is, if we are not serving in the family, then how can we serve elsewhere effectively”? The second game is similar but one designed to encourage more intimate communication. One would say “do you know what I really like you to do…” The respondent will then say, “I’ll try to remember that…” It’s a way to communicate our desires and a way for others to respond that they hear and understand. He recommends that we make these phrases games that we actually play around the dinner table or at times the whole family is together. In this sharing time the family members could also recognize the times other members have served during that day and acknowledge them. Responding in this way encourages the members regarding the importance of a service attitude. He concludes his small article on the attitude of serving by adding that serving each other should also serve as a transition to serving others as a family. He suggests such things as visiting the sick as a family, doing service projects for neighbors, serving in a homeless shelter, and other projects. This so called sign of a healthy family, reminded me of Peter’s exhortation to us all in his first epistle, Chapter 4 and verse 11. He says, “As each has received a gift, use it to serve one another, as good stewards of God’s varied grace.” Paul also exhorts us in Galatians 5:13. He writes, “For you were called to freedom, brothers. Only do not use your freedom as an opportunity for the flesh, but through love serve one another. Serving each other within the family, and then serving others as a family, is indeed one way to promote spiritual wellness in our homes.